Boil potatoes in salted water. When fierți squeeze them and turn them into a purée. When slightly cool, purée, add the egg, salt, pepper and flour, mix well until we get a soft and fluffy dough. Curățăm onion, a chopped tocăm and a FRY in vegetable oil until it softens. Add the minced meat, pour the water churn and a boil for about 15 minutes, then take off the heat and leave to cool. With a spoon take the dough, form a ball put the stuffing and then close well. 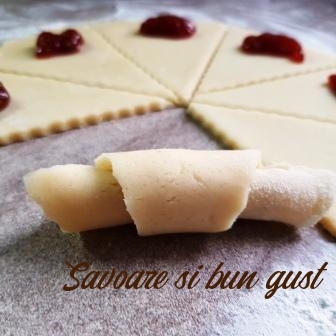 We do it with all the dough the same way, the procedure is identical to that of preparation of gomboților with plums. Boil gomboții in a large amount of water which was boiled along with a tablespoon of salt. Let boil until gomboții float to the surface, about 10 minutes. It will serve hot buttered presărați alongside a tasty spinach sauce.